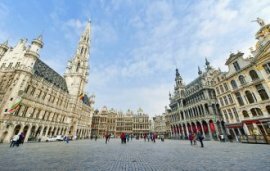 Right in the heart of Brussels Old Town, the city's main plaza (known as Grand Place) is one of the best preserved in Europe. Much of the square's elegant character is due to the unique architecture of its elegant Gildehuizen (guild houses) with their magnificent gables, pilasters, and balustrades, ornately carved stonework, and rich gold decoration. Most were built between 1696 and 1700 in the Baroque style but with some Flemish influences. The history of the Grand Place dates back much earlier though. It was first established in the 11th century and evolved soon after, to become the political and economic center for the city. The most recognisable building on the square is the Hôtel de Ville (Town Hall), built in 1402 with the intention of upstaging the Stadhuis in the rival city of Bruges. Inside are several magnificent rooms. Among the most impressive are the Maximilian Chamber hung with Brussels tapestries; the large Council Chamber with a superb ceiling by Victor Janssens and tapestries to his designs; the great banqueting hall and the Marriage Chamber, both beautifully panelled; and the Escalier d'Honneur with murals illustrating the history of Brussels. Along the Rue de l'Etuve is Brussels' best-known landmark, the Manneken Pis, usually besieged by a throng of tourists. 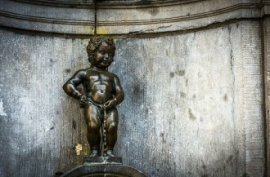 Although he can be traced back to at least 1388, nothing much is known about the origin of the figure of a little boy urinating, popularly referred to as "the oldest citizen of Brussels." The Manneken is, however, surrounded by various legends. According to one, the fountain is a memorial to a courageous infant who averted a conflagration, according to another, it commemorates the son of a count who succumbed to a pressing urge while taking part in a procession. The present statue was made in 1619 by Jérôme Duquesnoy the Elder and has been stolen on several occasions though always recovered. 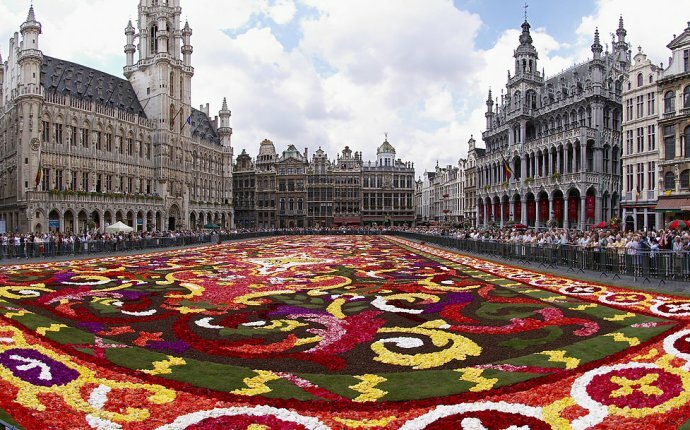 During major celebrations, events, and festivals in Brussels, the statue is famed for being dressed in costume. 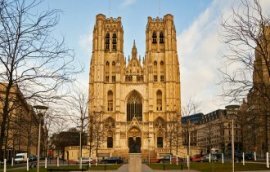 Dedicated to St. Michael and St. Gudula (the patron saints of Brussels) this Gothic church was first founded in 1225 but only completed in the 15th century. The facade is impressive, rising majestically above a broad flight of steps and crowned with twin 69-meter-high towers designed by Jan van Ruysbroeck. The beautifully proportioned interior (108 meters by 50 meters) is lavishly furnished and is home to some outstanding stained glass windows created by Bernard van Orley. Head to the transepts to see the finest examples depicting Charles V and Isabella of Portugal (south transept) and the Hungarian royal pair Louis II and Mary (north transept), and then into the Chapel of the Holy Sacrament, to the left of the choir, where the window illustrates the story of the Miracle of the Host. This gorgeous 1906 building, designed by Victor Horta, is home to the wonderful Comic Strip Center, devoted to the history of cartoons and comic strips in the country that gave the world The Smurfs and Tintin. A constantly rotating exhibition of 200 original comic strip drawings by Belgian and French comic artists is shown here. In addition, the museum documents the rise in popularity of Belgian and French comic strips through a cleverly curated collection of original manuscripts, draft sketches, and imaginatively reconstructed sets including Lucky Luke's saloon and Tim, Struppi, and Captain Haddock's moon rocket.